Move over Cheryl Burke, I’m stealing your dance partner. Let me start off this review by reminding you that I have two cats. Cats have hair. And cats shed. So with two cats, even while dutifully brushing them, there’s still a lot of cat hair lying around. When I first got the cats, I knew I had to get a good vacuum cleaner that could handle the kitties rejected fur. I chose a just for pets vacuum (that I will not name but will call the ‘Blue Machine’) that cost ~$250 and have happily spent the past year thinking I was cleaning the house well. Little did I know that I was just settling for something not-so-clean, because I didn’t know any better. A picture is worth a thousand words, so I thought I would share with you a picture that tells it all. This is the canister of the new Hoover WindTunnel T-Series Rewind after vacuuming a room that I HAD ALREADY VACUUMED. 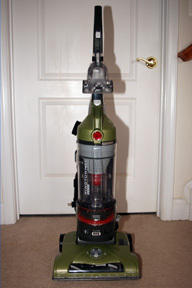 That’s right – I first vacuumed the room with the Blue Machine, then came in right after it with the Hoover WindTunnel. Now, I wouldn’t have been surprised if maybe it had grabbed a little bit of extra dust, but COME ON! That’s a big wad of cat hair that the Blue Machine left in the carpet! As soon as I saw that, I knew that Blue Machine and I were through and the Hoover WindTunnel T-Series Rewind was the new love of my cleaning life. The Hoover WindTunnel T-Series Rewind has more to offer than just excellent cleaning power. First, let’s address the “Rewind” portion of the name. This vacuum has a 27′ cord that conveniently gets spun around and stored in a space just beneath the canister. You pull out the length of cord you want to use, it locks into place, and when you’re done, just hit the lever and the cord will roll back up. No more wrap, wrap, wrapping the cord between two little handles. And no more big piles of cord that you have to keep shifting around as you vacuum. The Hoover WindTunnel T-Series was incredible easy to assemble out of the box. It took me (with the help of a screwdriver) literally less than a minute to turn it from pieces to fully assembled vacuum. This is the first canister vacuum that I’ve used that had a bottom-release canister. The other ones I’ve used (including Blue Machine) will have me flip a lever to pull out the canister, which is open on the top. This means that if any of the debris isn’t fully in the cup, or if there’s any dust, it goes flying around as I walk it to the trash can. With the bottom-release canister, I take the whole canister to the trash can, then stick the bottom in and push a lever. Ideally, all of the trash would just plop out through the bottom. I had to reach my hand up to pull out some of the debris because a lot of it was hair that didn’t want to succumb to gravity. These days, every vacuum has a one or two filters, each one costing $10-$20 to replace. The Hoover WindTunnel also has two filters (one is a HEPA filter), but these are special since they can be rinsed or dusted off and re-used! Imagine, we might not have to buy filters ever again! The ease of maintenance doesn’t stop there. It was easy to take apart and clean almost every section of the vacuum and the accessories – even the powered hand tool attachment could be taken apart so you could pull out any hair/debris that might have been trapped. 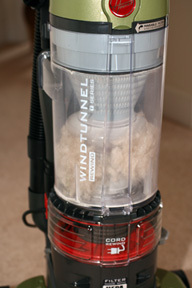 The Hoover WindTunnel T-Series Rewind is also a few pounds lighter than the Blue Machine, weighing in at 16.5 pounds. This means it was much easier for me to tote it up and down the stairs. It’s light enough where the user manual says you can simply pick up the vacuum and use it to clean the stairs. I found this to be kind of bulky and instead opted for the powered hand tool, which still demonstrated the full power of the vacuum. Other hand tool brushes (like the one on the Blue Machine) seem to only receive a portion of the suction power, and the brushes wouldn’t always be rotating at full speed. I love that the hose is easily disconnected from the base with the press of a button so I can use it with my accessories. Blue Machine makes me tug at the hose if I want to use the accessory tools. One feature that I didn’t get a chance to test was the System Check Indicator. This is supposed to change from green to red when you may need to change filters, check for clogs, or empty things out. I’m optimistic that with proper cleaning and maintenance, that sucker will never go red, but it’s cool that the vacuum will tell me if it needs to be checked. The Hoover WindTunnel T-Series Rewind offered superior cleaning to the Blue Machine for half the price! That’s a pretty big deal, especially since the Hoover WindTunnel vacuum I tested wasn’t designed specifically for pets, but worked better than the Blue Machine which was. By now, I’m sure many of you are thinking about trying to steal my vacuum away from me. Instead, why don’t you consider buying one for yourself? 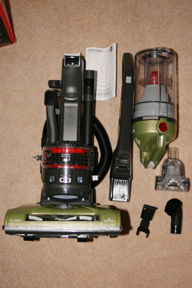 The Hoover WindTunnel T-Series Rewind is very reasonably priced with different models costing from just $99 to $159.99. Disclaimer: No compensation was given for this review/giveaway. I did receive a Hoover WindTunnel T-Series Rewind to test and use for the purpose of writing this review. This did not influence my opinions. The Fold Down Handle is great! My closet is packed so the less space the vac takes up is great. this vaccuum looks awesome! my mom would love it! I like the rewind cord. Ohh, I would love to win this. I like the fact that it has a system check and a fold down handle for easier storage. Keeping my fingers crossed that I win! the overall design is amazing and quite an improvement! I love that they are bagless. I have never had a vacuum that was bagless before. I really hate buying the bags for the vacuums. I love the sleek, lightweight design with superior cleaning as noted at website.Tooth Fairy NEEDs to vacuum up her *Fairy Dust*http://twitter.com/toothfairycyber/status/55658…Sweet Tweeted it! I love the sleek, lightweight design with superior cleaning as noted at website. I like the fact that it's so light weight; it'll make it easier for me to use. Hoover Vacuums facebook fan.entry #1. Hoover Vacuums facebook fan.entry #2.
i love that they are lightweight. I love that the power cord is 27 ft long. I hate having to stop constantly to try to find another outlet. I love all the bright colors it comes in and the automatic rewind cord! We have been making due with a broken vacuum for about a year, and could really use this! Thanks! I have a lot of hardwood in my house, this would be great. Ok, hands down it's the rewind cord!!! I hate cords and I hate vacuum cleaner cords. I'm loving this vacuum already, so cool! 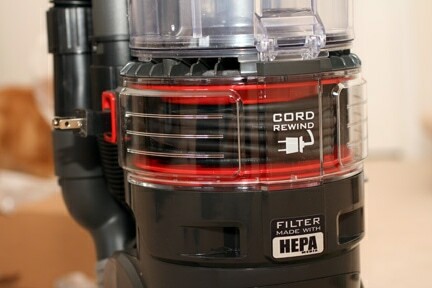 Wowy…love that it has a rewind cord…amazing! I love the way it looks…clear with a little color…CLEAN! I love that they are light weight! I just had neck surgery and cannot lift that much. This would be perfect! There are so many great features it is hard to narrow it down to one. I really love the fact that it is light weight, this will make vacuuming more endurable. I love the cord rewind feature, the fact that they're bagless, and the folding handle that would make it much easier to store. I also love the price (under $150) and the fact that they have free shipping and a 2 year warranty (instead of 90 days like I've seen on some vacuums! )Thanks for the uber-awesome giveaway! Totally need a new vacuum! Thanks for the uber-awesome giveaway! Totally need a new vacuum! I love that they are so light. Makes it so much easier to move around the house and clean if your vacuum doesn't weigh 30 lbs. Thanks for the contest! I like the carbon filter for odors. With pets and children, this is a great feature! I live in a 125 year old house that is 3 stories high and hardly any plugs, and the 27 ft cord on this vacume would really be a great help to me and I can get more of the dirt. Thanks! The 8 foot hose is awesome! Much easier to maneuver than mine! I like the features of a collapsible handle for small spaces and an automatic rewind cord for a vacuum – it's about time! Entering again – I tweeted the giveaway.